A bar of wonderful experience if drinking your handmade coffee every morning. 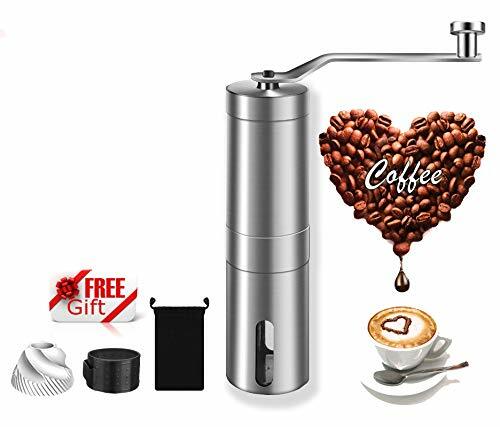 A great small lightweight portable manual coffee grinder- Make your day better by starting your day with freshly brewed, freshly grinded coffee beans. Convenient removable hand crank mechanism consistently eliminates over 90% of the noise that electric grinders produce. Imagine grinding your favorite coffee quietly in an office cubicle or in your kitchen when your loved ones are fast asleep. Simply adjust the ceramic burr grinder to your preferred coarseness, crank the handle a few times, and use with any number of coffee makers, including: Turkish, Coffee Boiling, Espresso, Aeropress, Moka Pot, Vacuum Pots, Siphon Brewers, Pour Over, Drip Brewing, Cupping, Cafe Solo, Drip Coffee, Chemex Brewer, Cold Brewing, Cowboy Coffee and the French Press. 1. Be sure the beans are dry enough and the grinder is clean before using it. 2. After Using it, it's recommended to use a soft brush (like toothbrush) to clean the coffee grinder. 4. When the adjustable screw is too tight, the male ceramic burr and female ceramic burr will be too close, it might be damaged. PERFECT GRINDING: With 18 click settings, from coarseness to fine grind, gives you precision. Without heat from the electric grinder, just the original flavor of coffee beans. PREMIUM 304 STAINLESS STEEL AND CERAMIC BURR：Our coffee grinder is durable wear resistant. The body and crank are all manufacture of high quality stainless steel 304 and it has a durable ceramic burr from Japanese. Added an extra ceramic burr, let your coffee grinder have double life. BEST PROTECT FROM SILICONE RING: Not hurt your hand, and it for better handling and storing, don't worry about losing the handle. ADJUSTABLE COFFEE SIZE: Simply to clockwise adjust the built-in adjustable screw to have a fine coffee powder you like, and anticlockwise can have a coarseness powder. Choose the size you like by rotate the screw. A TRIP WITHOUT PLAN: May be you like the lifestyle is I SAY WE GO, our grinder no need batteries and power, allowing you enjoy fresh ground coffee during your camping, hiking and trip, even in your office. Also a waterproof travel bag is help you carry your grinder anywhere you go. If you have any questions about this product by MSDUSA, contact us by completing and submitting the form below. If you are looking for a specif part number, please include it with your message.